Pick a suitable quiz template from this extensive list below. Try them out and sign up to discover just how easy you can customize any template and create your own design. It’s easy to add your own background images, logos, and text styles. These content templates contain the questions and answers for specific used cases. The design can be changed to your wishes afterwards. Why should you make a quiz? An online quiz maker is a useful tool for facilitating growth. How? Marketers can use quizzes as part of a social media marketing strategy to generate online leads or to drive engagement. Organizations also use quizzes to strengthen lessons from onboarding or training. Teachers and trainers can create a quiz to make lessons more interactive and engaging. It’s been researched and proven that regular quizzes, not to be graded or evaluated, boost memory retention, drive engagement, and make learning fun. The more often you test your knowledge, the more you’ll learn and retain. Don’t you want new staff to remember your processes and critical policies? Do you want customers to remember how to use key features so they can get the most out of your product? If you’re an online educator, isn’t it important that your students remember what you taught them? Don’t leave it to chance, make a quiz. 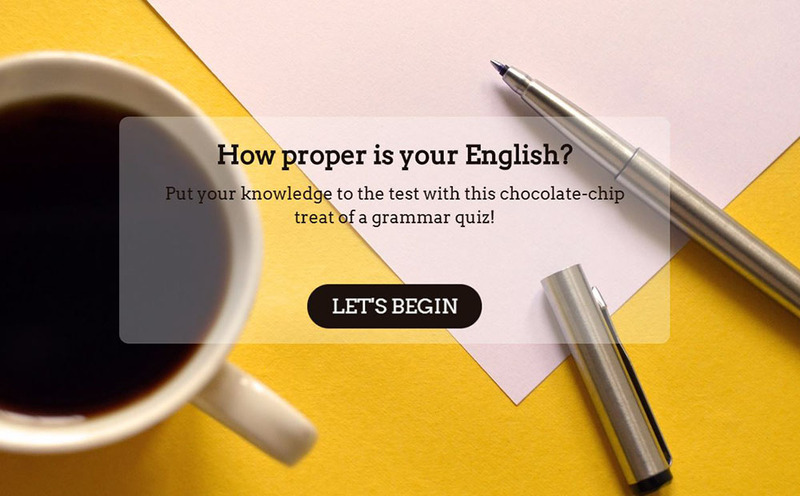 Quizzes should first and foremost track a someone’s progress—but they can be fun, too. An online quiz creator makes a great, interactive addition to classic exercises. You can have fun with it and take the edge off by adding visuals and GIFs. You can even send participants a personalized report. Create online quizzes about anything from pop culture to history and tie it back into your product or service. If you do it well, people will learn about themselves, make progress, and ultimately view you as the subject matter expert. If you’re looking to be more direct, take a look at our lead generation questionnaires. Maybe your company experienced a growth spurt that brought an influx of new staff in. Growing too fast could mean values don’t get transmitted, cultural norms give way to individuality, and organizational culture getting lost in translation. Use quizzes to help staff understand company history, get to know one another, and reinforce shared values. For any company, big and small, you can create a personality quiz, a trivia contest or anything you like to build or enforce culture. If you’re looking to improve your recruitment processes, take a look at our employee application forms or understand more about your staff with an employee satisfaction survey. Let participants know what they got right and wrong right away. Hand out incentives with interactive widgets such as a digital scratch card or slot machine and add some interactivity to your quiz. Let people take the quiz on-, offline and on any device they want with our offline functionality. To use this example, sign up to our professional trial and choose ‘Language Proficiency Test Template’ when creating a new survey. Looking for more quiz templates and examples? Survey Anyplace improves your data collection by improving your surveys. Most surveys today overlook the respondent’s experience, which is why they produce low response rates. Our survey maker creates modern-looking surveys that engage respondents, are easy to answer, and use cutting-edge mobile features - just like your audience. And you get greater response rates and better feedback. Let’s stay in touch, we’d like that!